Key POS terminals market players are Toshiba Corporation, Wincor Nixdorf, NCR Corporation, Ingenico Group, Cegid, CYBERNET, Epicor Software, NEC Corporation, GK Software SE, JDA Software, MICROS Systems, Panasonic, Verifone, Mi9 Retail, and Retail Pro International. The software segment in POS terminals market will witness high growth over the forecast timeline owing to the ability to improve the operational efficiency of the retail stores. It reduces the error rates and helps in speeding up the transaction process. It also provides the merchants with customized reports to witness critical information such as frequent purchasing of items and enable them to gain more insights about their business. The Mobile POS terminal segment is projected to grow at the significant CAGR in the point of sale terminals market over the coming years owing to the lucrative opportunities it is providing advantage of harnessing the smartphones to accept payments instantly. It is widely used in tradeshows, events and flea markets to enable the rapid movement of the customers through the checkout lines. The retail sector is getting more organized across the world, which will provide impetus for the industry growth over the next few years. This is due to the development of customized devices by the vendors to offer real time dashboard options, user profiles for different users. Such functionalities enable the retailers to streamline the workflow, thereby boosting sales and profits. The healthcare application segment in point of sale (POS) terminals market is expected to witness high growth opportunities owing to the rising need to streamline payment practices which is determined to drive the POS terminals market demand. The systems are enabling the exchange of healthcare data which includes administrative, clinical and financial data, through a secure and safe infrastructure. With the rise in high deductible insurance plans, and the patients desire to negotiate healthcare costs in real-time it has led to an increased number of card-based payments by patients thereby fueling the system installations at healthcare institutions and providing a growth impetus to the POS terminals market. 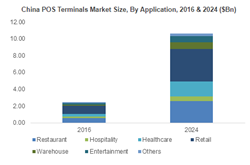 Global POS Terminal Market is expected to exceed USD 125 billion by 2024. The flourishing e-commerce industry is anticipated to provide growth opportunities for the POS terminals market due to the rising demand for digital sales channel. The vendors are focusing on replacing the traditional sales channel with the digital ones owing to the rise in the number of online customers and the need to penetrate into the untapped markets. Various e-commerce giants are also offering the card-on-delivery options which increase the demand over the near future. (POS) point of sale terminals market in APAC will witness high growth to 2024 as the manufacturers in the region are actively focusing on launching devices integrated with NFC, Bluetooth and QR Code enabled. The demonetization effect in India has caused the customers towards cashless transactions and the convenience offered by it.